Obsessed with trains, planes, and streetcars, Parker is an entrepreneur based in San Francisco, CA. In November 2016 we took a much needed vacation. 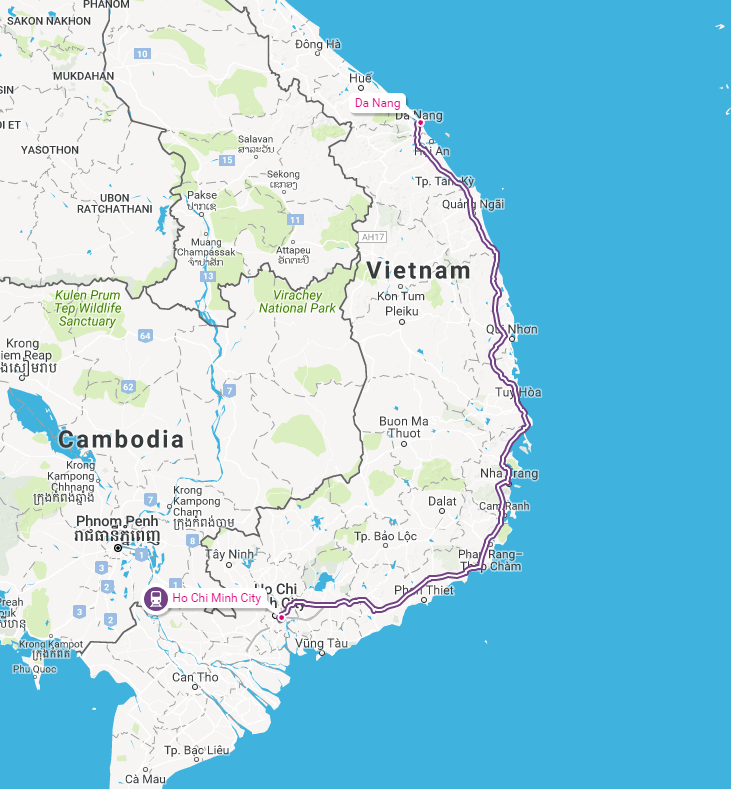 It didn’t hurt that China Eastern had some killer fares from SFO to Ho Chi Minh City (Saigon) that we couldn’t turn down ($450USD round trip/person? what?). 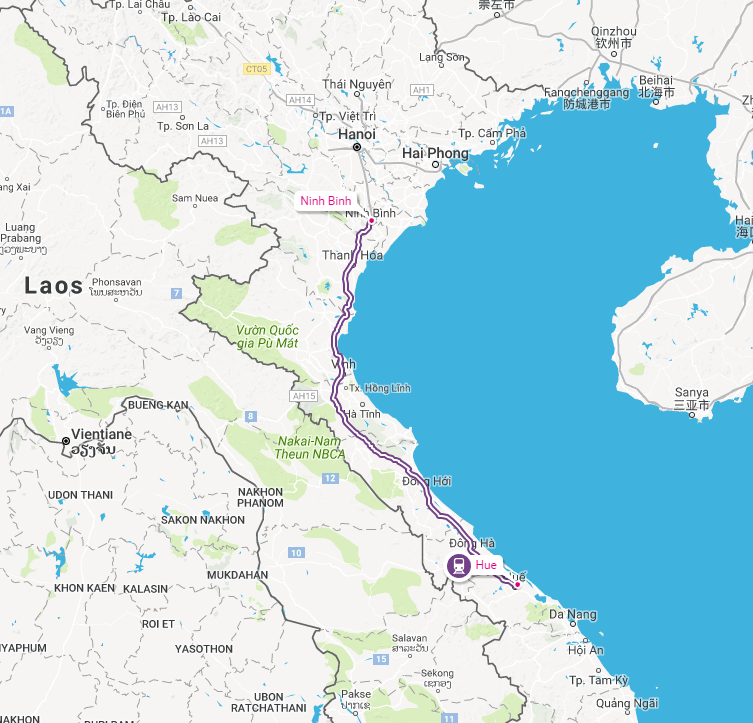 One of the interesting things about the history of Vietnam is their rail line between Saigon and Hanoi, and after a bit of research we figured out that this route would be a great way to take us between the two major cities with a few stops along the way. 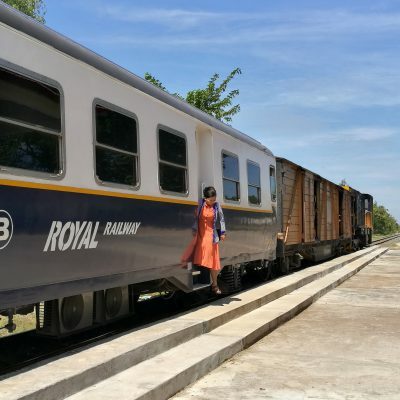 Sometimes you’ll read about this route referred to as the Reunification Express due to its linking of northern and southern Vietnam, but the official name is just the “North-South Railway.” To this day it follows almost the same exact route that was completed in 1936, 1,076 miles of mostly single, narrow gauge track. 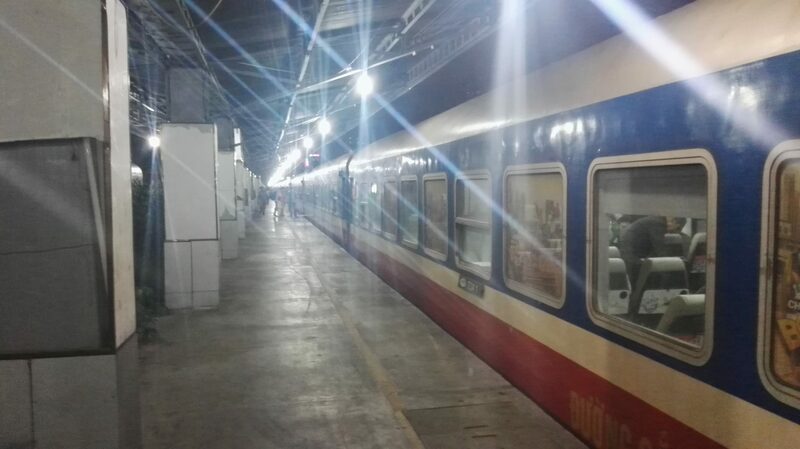 There are a few express trains and a few local trains each day, all run by Đường sắt Việt Nam. From our experience, the trains are generally very full. 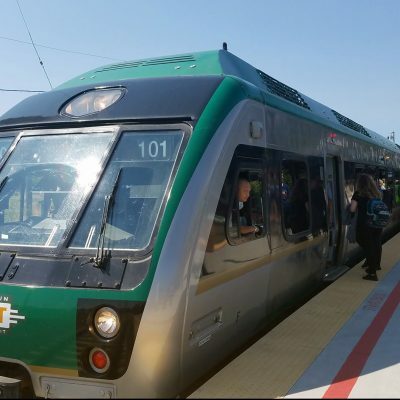 At times they will add another car onto trains that are selling out, so if your preferred train is not available at first, keep checking. 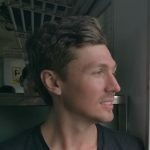 Although it will cost a few dollars more, if you want to book your tickets online I highly recommend Baolau.com since you can pay with a foreign credit card and secure a spot on the train you prefer. They even sent us PDF boarding passes so we didn’t have to retrieve our ticket from the station. Our trip was broken down into four segments: 1. Saigon-Da Nang, 2. Da Nang-Hue, 3. Hue-Ninh Binh, 4. Ninh Binh-Hanoi. I won’t go into what we did in each spot, but here’s a bit about the journey. 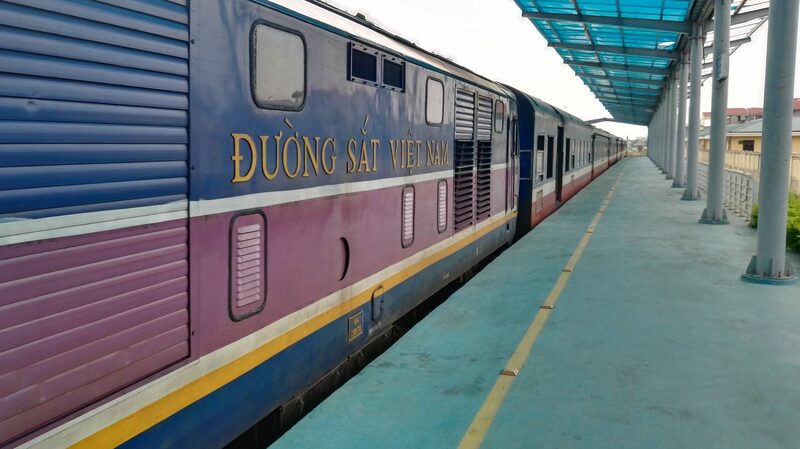 For this trip we booked one of the express trains (SE #2) leaving Saigon in the evening and arriving to Da Nang around noon the next day. 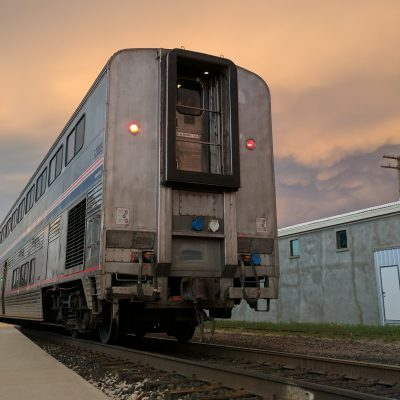 In the “Soft Bed” class train 2 uses refurbished sleeper cars with four bunks to a cabin. The top bunk is a bit tricky to get in, but there are a couple of power outlets, air conditioning, and a table. 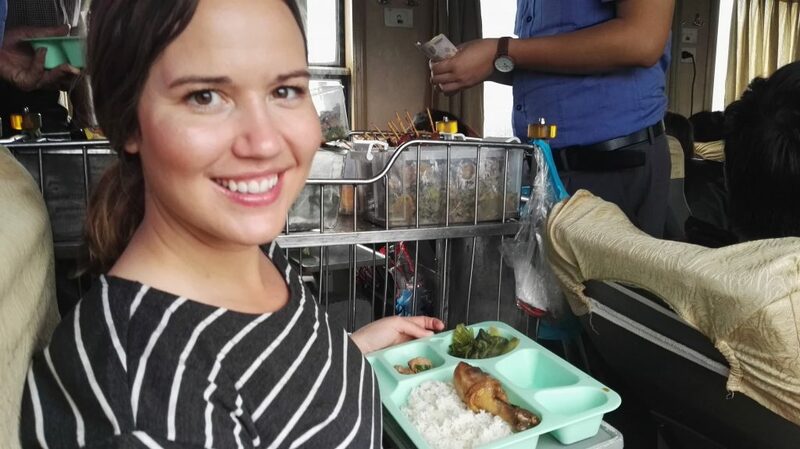 The Saigon train station is small, but there are some shops to buy water and snacks for your journey right alongside the tracks, at a little bit of a premium. Make sure to check posted prices. We had a few different cabin mates along our trip including the one of the nicest people we met on our trip, an architect from Saigon who was so proud of his kids studying abroad in the United States. We’ll probably never forget the conversations we had with him, as broken as it was at times due to us not speaking any Vietnamese. Leaving Saigon you really get an idea for how big and congested the city is. Most of the railroad crossings are manually operated arms with traffic police. It’s something to behold one traffic cop holding back what seem to be an endless pack of motorbikes. Train attendants bring around food and drink carts. You never know how many carts will be going around so I suggest buying too much instead of not enough. Food and treats were inexpensive and none were inedible – some were actually quite good. We had a beer with our Architect roommate before heading to bed. Soup in plastic cups and a full plate of food. Train SE2 ended up being the nicest train we rode on the whole trip in terms of comfort. It had the best food and the scenery was really beautiful the next morning leading up to Da Nang. The train rode a bit “bouncy” but nothing too scary. Bathrooms were generally clean enough (they literally spray them down with a hose) although very utilitarian. I would take some bottled water for brushing your teeth and staying hydrated. Rice fields and yours truly. Coming into Da Nang we noticed how close the builds are up to the sides of the train. Literally it seems like you could reach out and knock on someone’s front door. There were many official taxis available to meet the train. 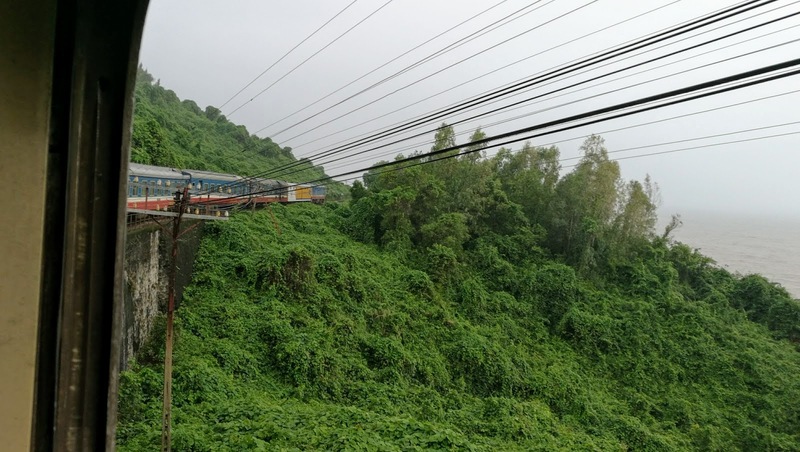 After a few days in the Da Nang/Hoi An area, we were excited to see what is often considered the most scenic part of the North-South Railway, the journey along the cliffs just north of Da Nang. This part of the railway is not as fast as newer buses, but the route is right on the water and very scenic. We did “Soft Seat” class on train TN 2. The TN trains are not as nice as the SE trains and tend to be a bit slower, but for this journey it was the one that fit our schedule the best. 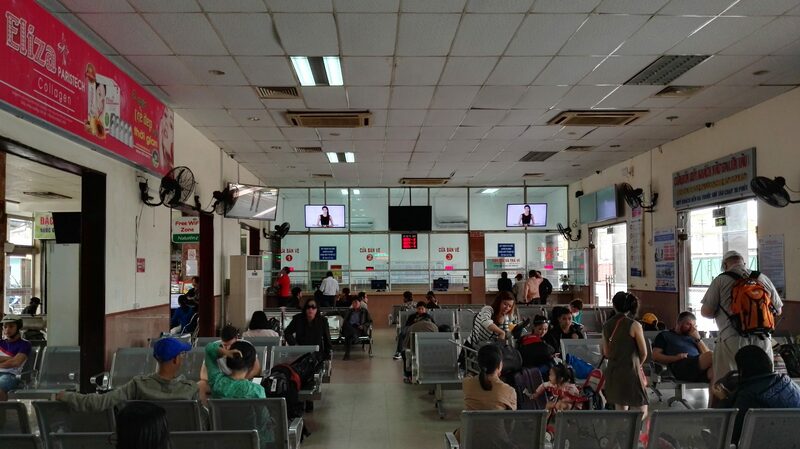 The Da Nang train station has a small waiting area with an attached restaurant. We had some nice coffee there while waiting to board. You’re not allowed onto the train platform until boarding begins. Boarding at Da Nang. Seats are assigned ahead of time for the Soft Seat. I’m glad we bought our tickets ahead of time because this train was packed full. The car was nice enough, and seats were generally comfortable. There was a power outlet for me to charge my phone between pictures. The girl seated in front of us almost immediately struck up conversation with us since she had started studying English in school. She was very nice, from a rural part of the country but going to college in Hue. The views of this part of the route are not to be missed. For two hours you follow the sea. There is lush vegetation, waterfalls, beaches, and winding tracks along the hillside. Attendants still came through with some snacks and food carts. 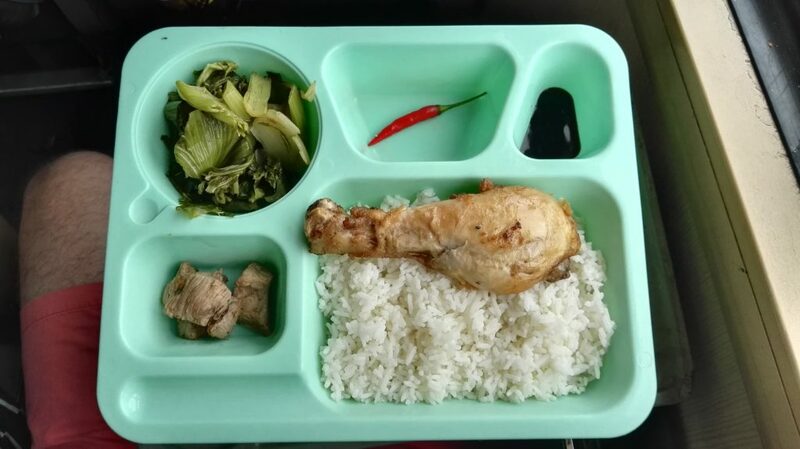 Even though this was one of the smaller trains, the food was similar. We went ahead and got a full meal since we would only be spending the day in Hue. I had found out ahead of time that there is a guy who goes by Mr. Pho with a small restaurant and house right next to the Hue train station. He speaks English and will watch your bags while you explore the city. We would highly recommend him! He gave us a map, we told him what train we would be catching later that day, and we were off to explore Hue for the day. When we got back later that evening, Mr. Pho was waiting up with our bags. 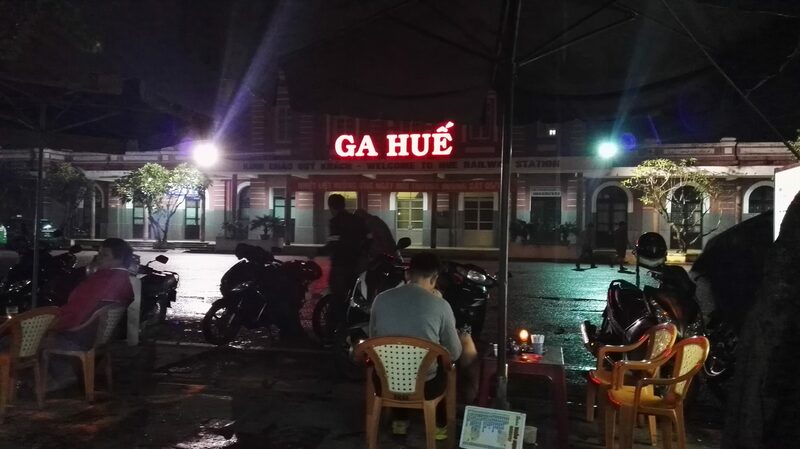 There were quite a few (extremely local) restaurants right at the train station in Hue. 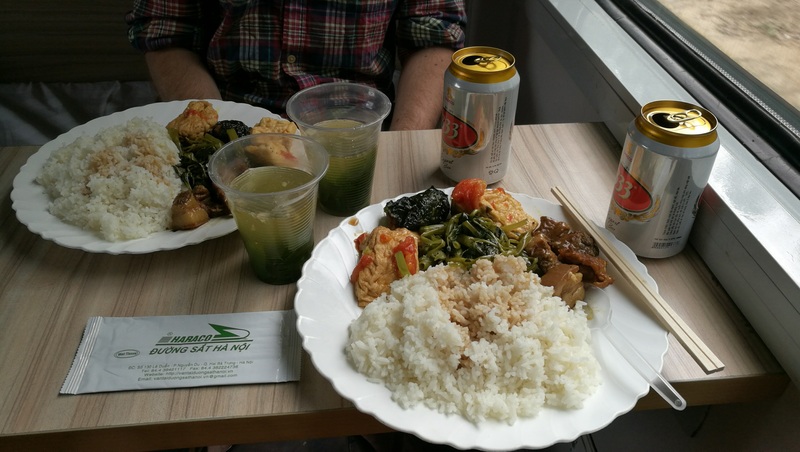 You could easily grab a bite and beer before catching a night train, as we did. Be careful with the pricing of bottled water and snacks at the merchant in the train station. We only realized after the fact that we had way overpaid for some bottled water before catching the train. Grabbing a drink while waiting for our train near Hue Train Station. For this service we took SE20 – an overnight express, but one that was not yet refurbished . 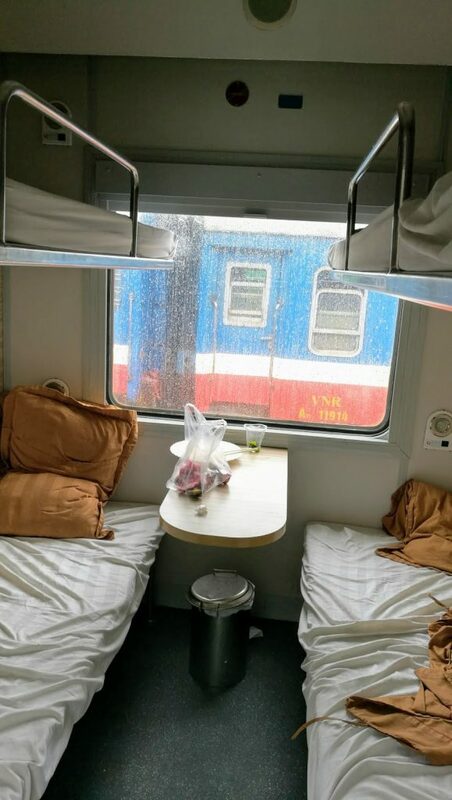 The soft sleepers had the same configuration as SE2, but with older lighting, only one power outlet split between the four beds, and the mattresses themselves were much harder. Air conditioning worked pretty well although it would get a bit too cold, then a bit too warm. Bathrooms were not as clean as they were on SE2 either. Soft Sleeper room – older style. 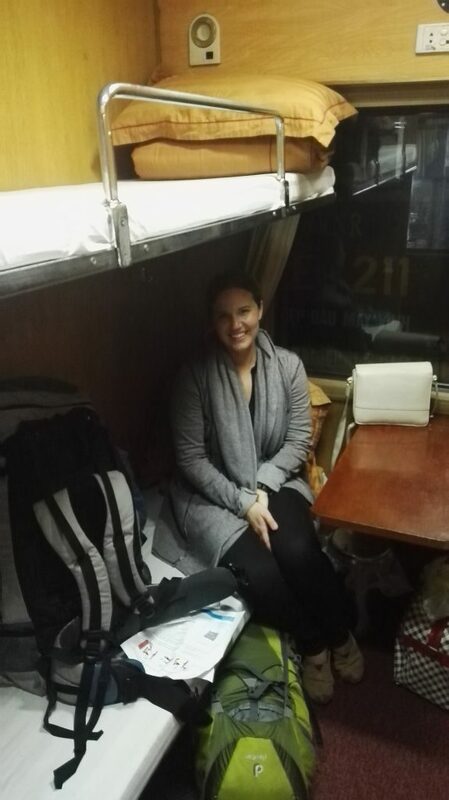 We shared this cabin with an older gentleman headed to Hanoi. He spoke not a word of English, but would occasionally talk to (at) us. 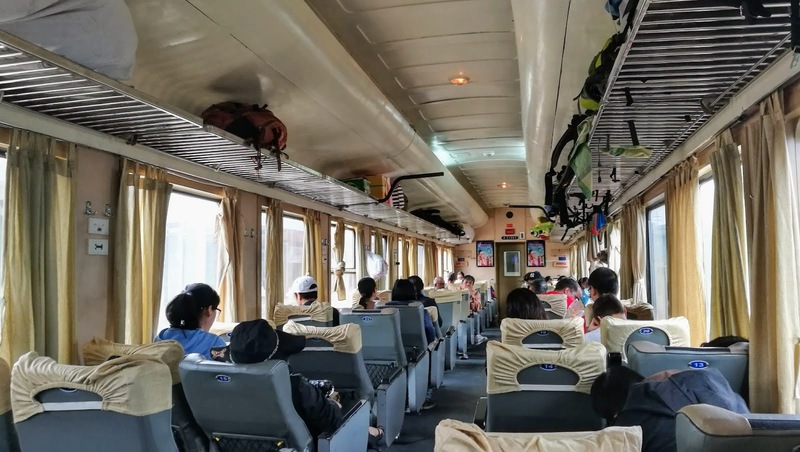 At the beginning of the trip he told the train staff that we wanted a private room, and the train staff also didn’t speak English, so it was very difficult to figure out what was going on. 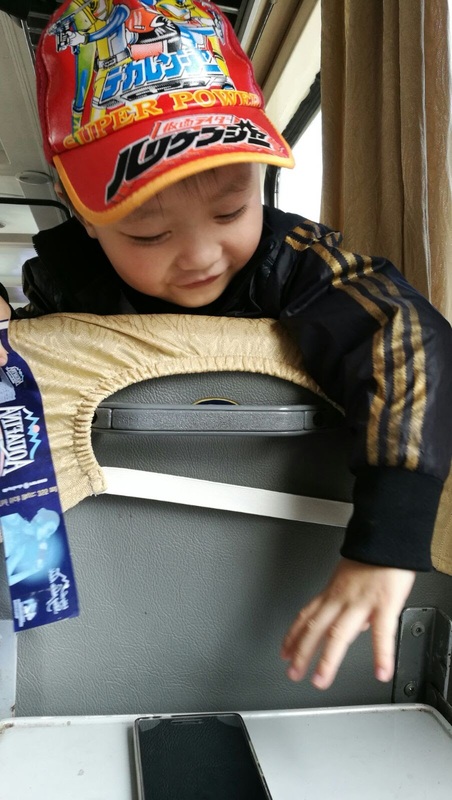 We were pretty sure he hated sharing a room with us, but on our arrival to Ninh Binh he made sure we knew it was our stop and was extremely nice to us. Maybe he was just happy to see us go! 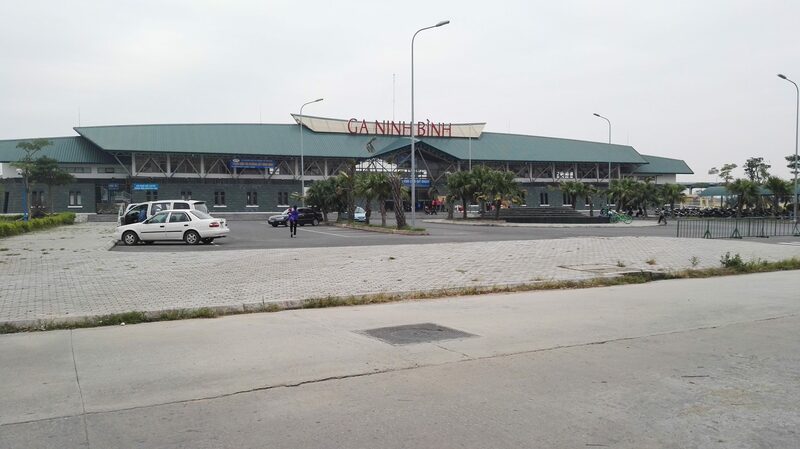 The new train station in Ninh Binh on the south side of town. 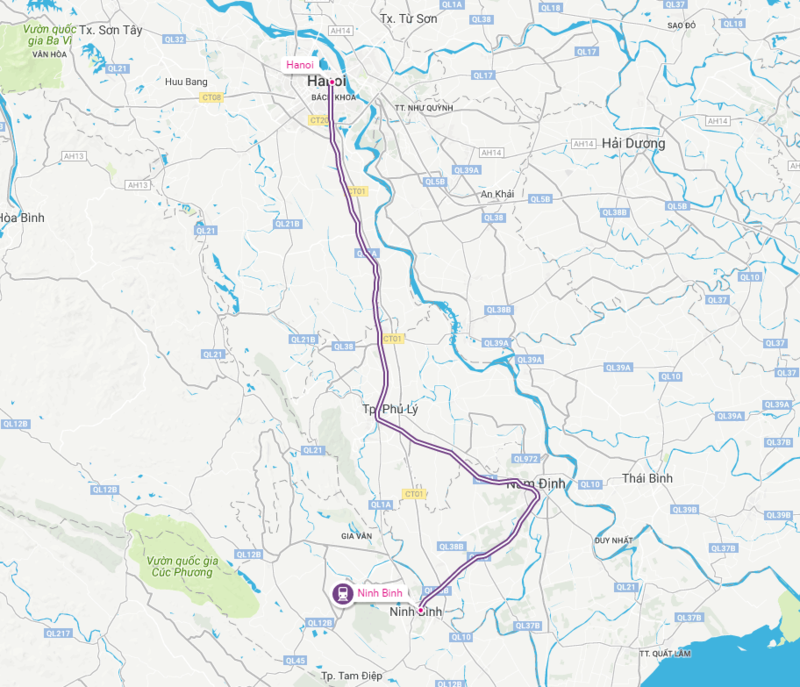 The track between Hue and Ninh Binh is generally curvy and not in near the condition of the track from Saigon to Da Nang. The car would sometimes have a bounce with a bit of momentum, all while jolting side to side. I’ve taken many trains and have not felt anything quite like it. It did make it a bit more difficult to sleep, although Vanessa claims she had no problems. The hotel on the corner allowed us to leave our bags overnight since we rented a motorbike from them. 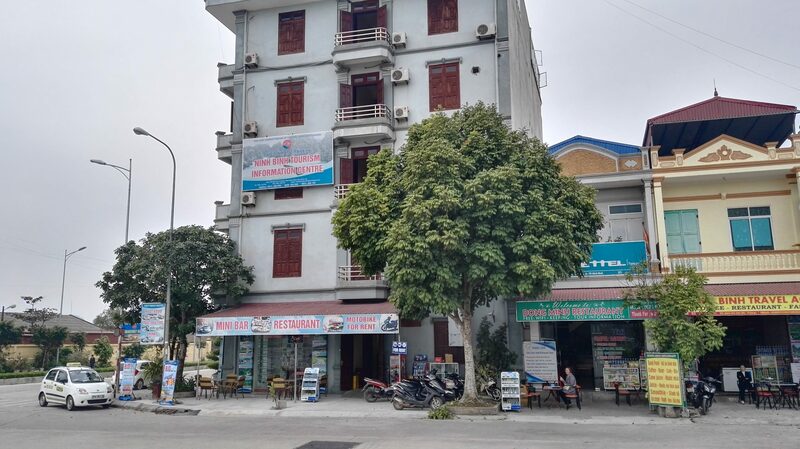 We arrived at the new Ninh Binh train station the next morning and walked just across the parking lot to a hotel that allowed us to rent a motorbike and leave our bags overnight. One thing I like about traveling in Vietnam is logistics that can be complicated in other countries were very easy. Leaving bags, renting a motorbike, grabbing breakfast – you can do it all in one stop! For this daytime journey we decided to take a soft seat. Again, the train was full. 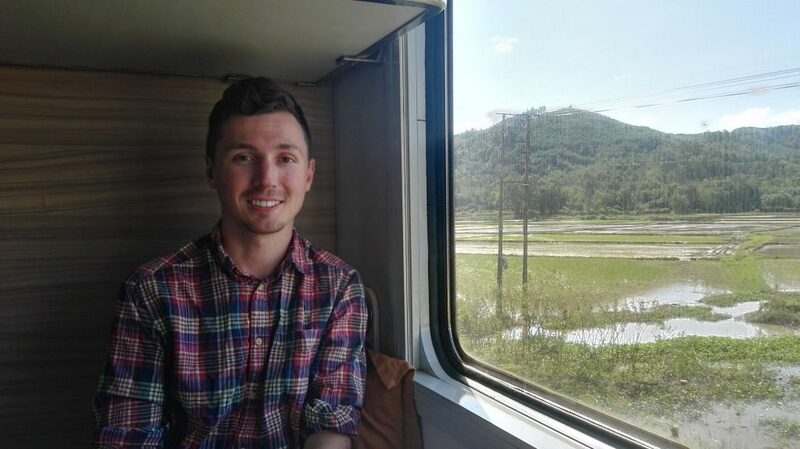 Surprisingly there were many more tourists on this train than any of the others, I think because of the proximity to Hanoi and the natural wonders surrounding Ninh Binh. We took train SE20. SE20 arriving at Ninh Binh. 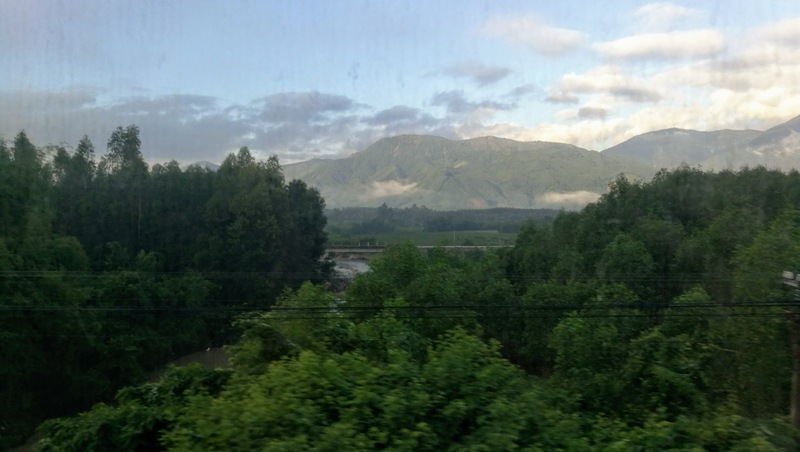 The scenery on this part of the trip was probably the least interesting of the whole North-South Railway. 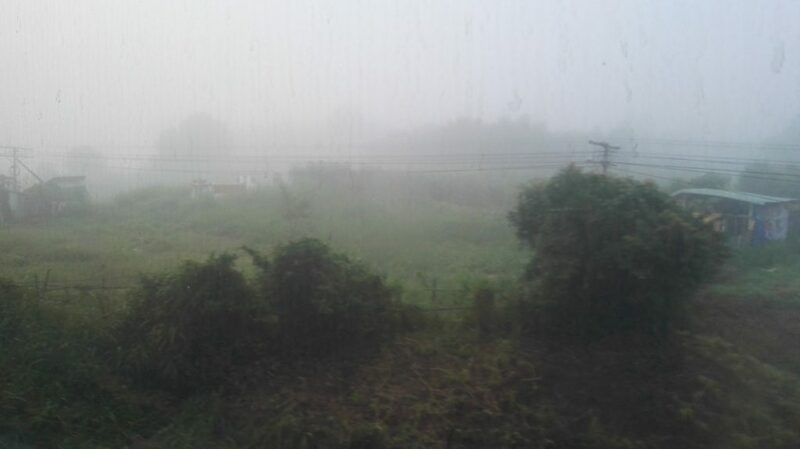 The most interesting part was approaching Hanoi with the narrow alleys the train navigates. Awnings on each side of the street come right up to the side of the train and people stand just off the side of the tracks. While entering Hanoi there is a long recorded announcement in both Vietnamese and English about the beauty of the city and the national anthem. It felt a bit propaganda-y, but was interesting. 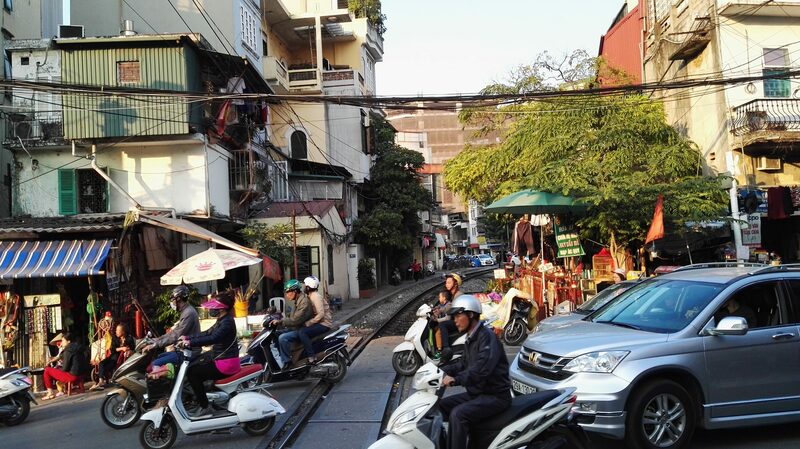 The tracks in Hanoi really snake between buildings, this isn’t even narrow compared to some parts. Luck for us we had our own entertainment for the trip. The little boy in front of us loved interacting. He was so cute! 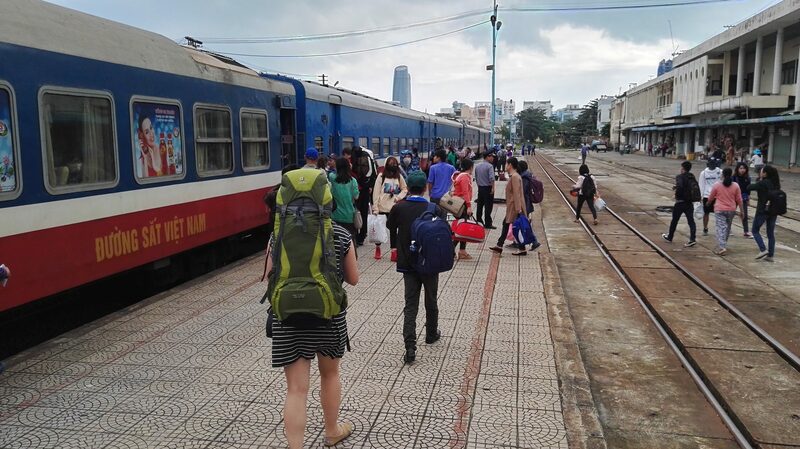 Taking the train in Vietnam is easy to do as a tourist, and it’s probably safer than taking a bus. You meet other people and see parts of the landscape that are just beautiful and uniquely Vietnamese. 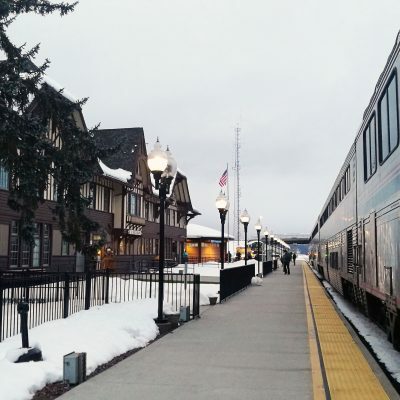 The price is great, especially on overnight trains where you aren’t paying for a hotel. Total, we paid about $170 USD for two people, even with the small fees from booking online. Of course that didn’t include all of the food and extras we bought along the way, but it’s still extremely inexpensive for such an experience. 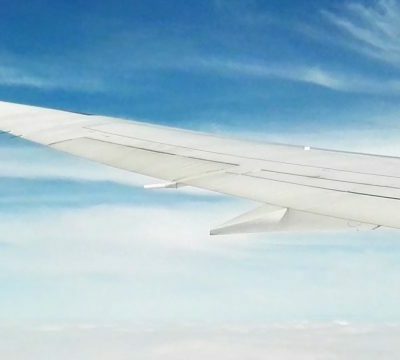 As always, be sure to bring some bottled water, a face mask, ear plugs, maybe a airline blanket, and don’t expect the best sleep of your life. In return you’ll have a lot of great memories and a better understanding of Vietnam as a country. Thank you for posting this. I am just revisiting our web pages from a trip to Vietnam, rescanning and making the photos more presentable. 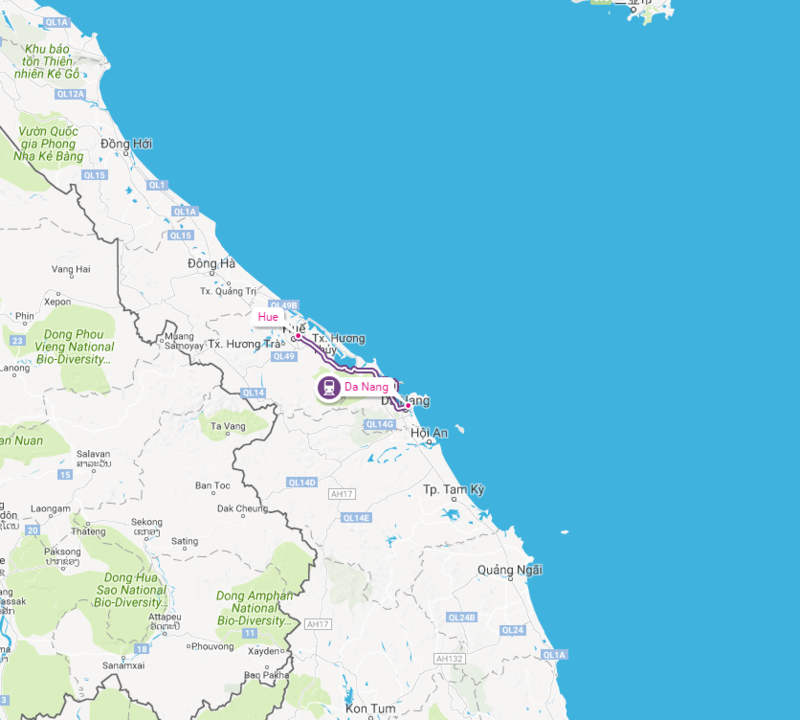 I found your site when searching for more up to date info on the journey, We took the train from Hue to Hanoi in 1994 and it was nothing like this! But then the whole country was still reeling from the after effects of the war. Bill Clinton announced he was reopening relations with the Vietnamese as we were heading for the flight home and it has been full steam ahead for them ever since. Hi Sue – thanks for taking the time to leave a comment. I can only imagine what traveling through Vietnam in the mid 90s was like. You’re lucky to have experienced that pivotal moment in time! Surely a lot has changed, and I’m sure it’s even changed since my trip in 2016. Safe travels!